Prepare Basic Pizza Dough as directed below. Heat oven to 500 degrees. Coat 13" x 9" shallow sheet pan with 1 1/2 tablespoons olive oil. Add garlic and onion and coat with the oil in the pan. Roast in oven on middle shelf for 10 minutes. Add zucchini, eggplant, tomatoes, and red pepper. Drizzle with 1 tablespoon olive oil. Continue roasting 15 minutes. Add mushrooms; toss to coat with oil in pan. Roast 5 to 10 minutes more until vegetables are crisp tender. Do not overcook. Season with salt, pepper, basil, and thyme. Allow garlic to cool. Press garlic pulp onto vegetables. Lightly brush crust with remaining oil. Sprinkle with chopped rosemary. Place 1/2 cup mozzarella on herbed crust. Top with roasted vegetable mix and olives (about 4 cups). 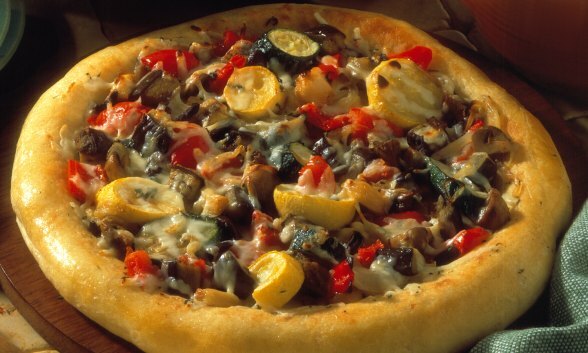 Combine remaining mozzarella and asiago cheese and sprinkle over vegetables. Place loaded Pizzazz® baking pan on Pizzazz® pizza oven and bake on DUAL setting for 15 minutes or until cheese is melted and bubbling.